Install and run Ubuntu (or Windows, etc) on a bootable USB pendrive: Live Ubuntu USB with Rufus | TechNarcs '+g+"
What is a bootable pendrive? A bootable pendrive is similar to a bootable dvd, such as the Windows installation discs. They basically come with their own operating systems or system utilities ready to install or use on boot without any dependency or requirement for an operating system installed on the PC. 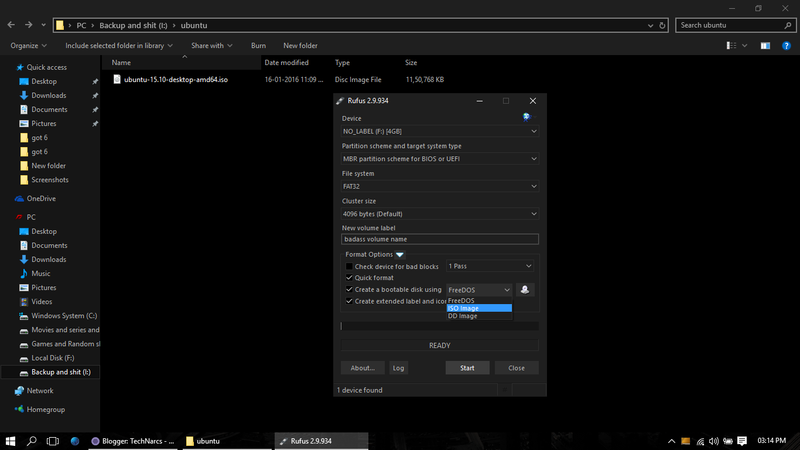 Every experienced PC user should have at least 1 bootable installation media, in case their system crashes or malfunctions, and there are also many useful bootable utilities to fix issues with bootloaders and backup data. And what's a Live CD/USB? A live CD, DVD or USB is a bootable media which contains a complete installation of an operating system or utility which can run in the computer's memory/RAM rather without any need to be installed on the HDD. Now this can be extremely useful in many cases such as backing up data in case of OS failure, making changes to the partition table, and also it's a really efficient option for people wanna try out different operating systems without having to dual boot or running em in virtual machines, and there's a bunch of useful system utilities that can be ran on live CDs which we'll perhaps cover in some later posts. So what are we gonna do today? A USB pendrive with atleast 4gb memory(2 might do it too though). A computer running windows xp or later version (I'm on 10). plug in your pendrive and make sure it doesn't contain any important data. Run rufus by clicking on the .exe file you downloaded. choose the usb drive you attached under "device"
let the file system be fat32 or ntfs depending on your usb, it doesn't matter coz ubuntu would use ext2/ext3/ext4. set an interesting volume label or something simple like "ubuntu". 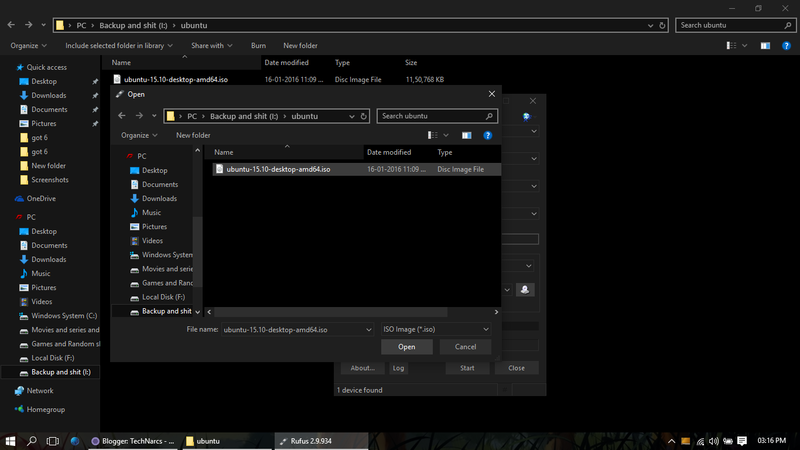 choose the iso image option as highlighted in the screenshot. and then click on the disc icon to the right of that list to choose your ubuntu iso image. select your ubuntu .iso file and click on open. leave the rest of the options as they are by default. finally, click on the "start" button and accept any warnings that pop up. let the program run and keep an eye on the progress bar if you want, it'll notify you when it's done. STEP 3.. No wait there were only 2 steps, we're done! Once you're done with that you can simply plug the pendrive in any Computer, and you'll have the option to boot from USB drive when you start your PC (if it doesn't show, select your USB drive as the primary boot device in your BIOS settings). When booted up, the Ubuntu installer will give you the option to install it(that'll install it) or try it(live version, select that). Boot into your new portable OS and do whatever people do with portable operating systems. And with that you have successfully created a bootable Ubuntu USB pendrive! Be sure to share your views, ideas and feedback in the comments and feel free to ask any questions whether it is regarding the topic or even if it's totally unrelated, I'll be sure to respond. Also, please do tell me if I made any mistakes or typos so I could fix em.